WORCESTER, Mass. 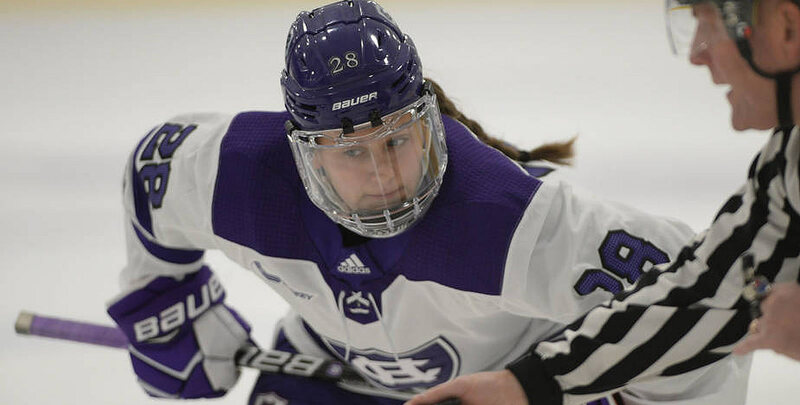 - Freshman Jada Brenon made 34 saves and junior Rachel Moore scored twice as the Holy Cross women's hockey team defeated No. 5 Northeastern, 5-3, Friday night at the Hart Center for its first Hockey East win in program history. The Huskies go down as the highest ranked opponent that the Crusaders have ever beaten. On a night where they were outshot, 37-17, the Crusaders made the absolute most of their opportunities to grab the victory. Down 2-0 after the first period, Holy Cross came out in the second, a frame that has been notorious for giving the team trouble this season, and got two goals to tie it up. Then in the third, the Crusaders scored two more to go up 4-2, before Northeastern got one back to pull within one. With ten minutes remaining, Moore corralled a rebound to put Holy Cross back up by two and that's where it would stay. Despite heavy, sustained pressure from the Huskies for three straight minutes to end the game, Brenon and the defense stood strong, turning away shot after shot. 1-0 NU (1st, 5:33, EV): The Huskies grabbed the lead early in the game thanks to Alina Mueller. 2-0 NU (1st, 7:29, EV): Northeastern quickly added a second and appeared primed to run away with it in the first. 2-1 HC (2nd, 2:42, PP): Carlie Magier continued her impressive freshman campaign when she got on the end of a strike from Antonia Matzka and was able to redirect it into the back of the net while on the power play. 2-2 HC (2nd, 9:40, EV): The Crusaders would tie it up after a puck took a strange bounce at center ice. Amanda Kewer found herself streaking towards the goalie with two defenders on her heels. She fired a shot that hit Northeastern's Brittany Bugalski's shoulder, ricocheted up and over, and dribbled across the line. Something was starting to feel different about this one. 3-2 HC (3rd, 00:25, EV): Moore scored her first collegiate goal just twenty-five seconds into the third period to give the Crusader their second lead ever in Hockey East play. 4-2 HC (3rd, 6:48, PP): The Hart Center erupted when Maeve Reilly was in the perfect spot to send home a rebound off of Matzka's shot to take the two-goal lead on Holy Cross' second power play goal of the game. 4-3 NU (3rd, 9:06, EV): Being the outstanding team they are, the Huskies weren't going down without a fight. Chloe Aurard put Northeastern within one with nine minutes to play. 5-3 HC (3rd, 10:15, EV): Moore got her second of the night to ice it for the Crusaders. She was right in front of the net to grab the rebound and beat Bugalski over her right shoulder. - Friday's win will go down as many firsts for the program. First win of the season, first Hockey East win, and the highest ranked opponent that the program has ever beaten. - The Crusaders scored twice on the power play for the first time this season. - Holy Cross was only called for two penalties all game, tying a season low. The Crusaders will face off against the Huskies again this Sunday, Dec. 2. This time, the game will be played in Matthews Arena in Boston.